Dave Farrar predicts goals galore when Canuck cousins Toronto and Vancouver Whitecaps face off, while NY Red Bulls can carry on winning and Portland Timbers trouble RSL. 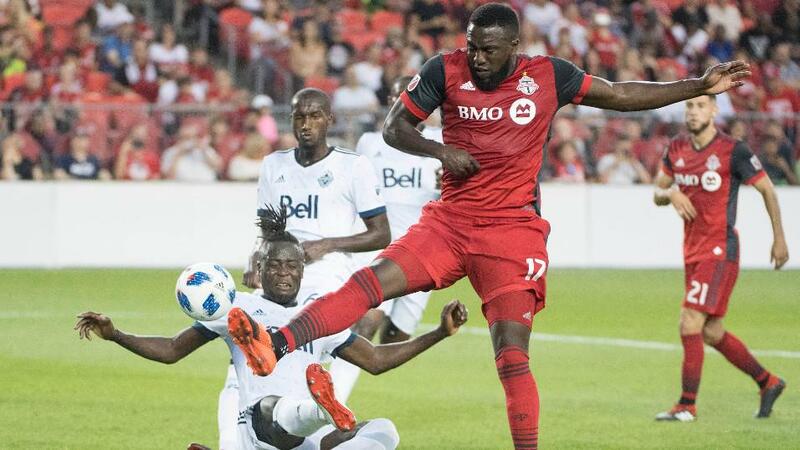 Toronto discovered some of their old swagger last week as they comfortably beat the New England Revolution, and now they know that they have to win their last four games of the season to have any chance of reaching the play offs. Their chances are slim, although the fact that one of those remaining games is against the team they're trying to catch, Montreal, gives them an opportunity. First, though, they have to deal with the third Canadian team in MLS in the shape of the Vancouver Whitecaps. Many saw the 'Caps decision to part ways with their manager Carl Robinson last week as a surprise, but those in charge could see post season hopes fading after two home defeats and made a brave call. Interim Coach Craig Dalrymple now has the job of trying to guide them to the play offs. He didn't make much impact last week, as his team went down 3-0 at LA Galaxy, and this is a similarly tough task. Toronto are in form, and have now won five of their last six home games, scoring at least three times in all of those wins. We have some recent form as well, with Toronto beating Vancouver 7-4 over two legs to win the Canadian Championship, and I can't see beyond a heavy home win here, in a game full of goals. The New York Red Bulls kept the Supporters Shield race alive, and surprised this column, with their win against Atlanta United last week, and now they face a more comfortable task as they head for San Jose. The Red Bulls haven't won a regular season game in San Jose since 2003, but with the 'Quakes having lost their last five, and having nothing to play for, I expect the returning Bradley Wright-Phillips and his teammates to deal with this latest hurdle fairly bloodlessly. It's San Jose's defence which has cost them this season. They look good going forward, as they did against Houston last weekend, taking a 2-0 lead, but are incapable of holding on to leads and seeing games out. They have conceded three or more goals in their last four home matches, and with the Red Bulls a well-organised defensive proposition, they could be in trouble here. The Red Bulls will press high and apply pressure, and I don't think that the 'Quakes will cope. There's a danger of complacency after last week's big win, but Chris Armas won't allow that and so the Red Bulls are a confident selection. This is a game with huge implications at the top of the Western Conference, as the Portland Timbers head for Real Salt Lake. Both sides had battling draws last weekend, and given that this is the first of two meetings between now and the end of the season, these two are likely to define each other's campaigns. The Timbers have a two-point advantage over sixth-placed RSL, and they look a big price at [4.2] to win this. They've played better recently after a worrying slump, although Diego Valeri doesn't have a good record against this weekend's opposition, scoring just twice in 13 appearances against RSL. Their 0-0 draw against FC Dallas last week was a battling display, and I think that we'll see something similar here, against an RSL side that hasn't won in three, and has been held here recently by Minnesota, Montreal and Colorado. Their 6-2 win against the Galaxy was a headline-grabber, but the reality is that they're a pretty dour side. That's true of Portland too, and I think that we'll see a low-scoring game, with the Timbers either holding on for a draw or nicking a crucial win.